One plant with four different looks - each one unique for each season! Foliage colours transforms throughout the year from buttery-yellow, bright lime, golden orange and red, with small crimson flowers in the summer as the tree matures. Also known as the ‘Golden Full Moon’ Maple, this slow growing beauty has stunning and unique fan-shaped foliage. Perfect for any garden, it is easy to grow and very hardy even in the coldest parts of the UK. Supplied as a 3L potted plant approx. 50cm tall. 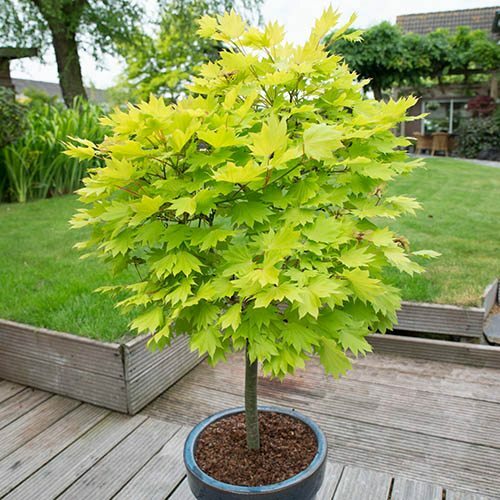 Also known as the ‘Golden Full Moon’ Maple, this slow growing beauty has stunning, uniquely coloured and shaped foliage. Starting with buttery-yellow leaves in the spring, in summer the tree the foliage transforms in to a display of bright yellow/lime, before its leaves complete their transition to golden orange with red margins in the autumn. Small crimson flowers appear in summer as the tree matures.